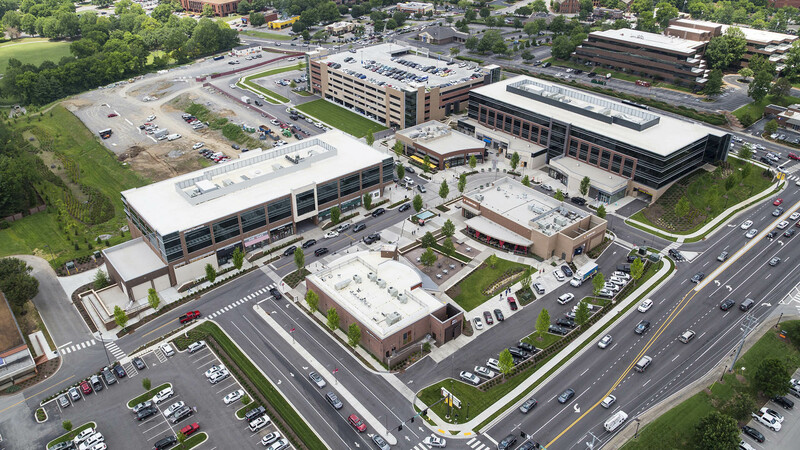 TMP, with Associate Architect Cooper Carry, developed the Hill Center Brentwood expansion at the prominent corner of Maryland Way and Franklin Road in Brentwood, Tennessee. The development is intended to unify the existing Hill Center Brentwood to the south with approximately 600,000 SF of new mixed-use office and retail space, while creating an iconic corner as a gateway to Maryland Farms. The development will be constructed in multiple phases, with Phase 1.1 completed in fall 2016, Phase 1.2 completed in summer 2017, and Phase 2 currently in development. A new main boulevard through the site connecting East Park Drive and Chadwick Drive. Connection to the existing Maryland Way Park to the west. Creation of Place with a central courtyard in the retail areas along Franklin Road. Shared parking between two parking garages and below-building parking areas designed to fit within the character of the center while minimizing surface parking. Improved storm water runoff control and designed green space & open space. New entrance connection from the existing Hill Center Brentwood to the new CityPark development across Franklin Road.